Patents are like tiny little windows into a possible future. They offer a look at what companies are working on in their secretive research and development labs, and whether or not they ever materialize into something real, they can tell us where a company's head is at. And no company is more secretive than Apple, which makes its patents more fascinating than most. Eric Slivka, editor-in-chief at MacRumors, tells Wareable that Apple is so protective about what it's working on that it tends to patent a wide range of stuff. A lot of that patented stuff doesn't actually make it into products. That's because the time period between Apple filing the patent and the patent getting published is long, which means that Apple could have changed its mind or found a better way to approach the idea. "There's some question as to when you see a patent whether that's something that's coming up, or whether it's something they decided not to do, or something they filed a patent on just in case or to try to shut somebody else out," Slivka says. Jack Purcher, who runs Patently Apple also points out how hard it is to guess which patents will turn into a product "because patents are a living thing at times - in that they could take 10-plus years to come to market." He notes that, for example, the iPhone was couched in iPod-like patent filings that didn't exactly describe the product Apple was working on as a mobile phone. Apple also continuously updates old patents as it works on new software, devices and services. For instance, Purcher points out the US Patent Office recently published an update for a patent that was published way back in 2005, 13 years ago. However, it's also possible to see what Apple is working on when looking at its patents. Even though Steve Jobs famously came out against the stylus, causing people to adamantly believe Apple would never make a stylus, yet Purcher and Patently Apple reported on Apple's patented idea at the time for an advanced smart pen that had low latency. That smart pen eventually turned into the Apple Pencil. So while it may be impossible to tell which patents will directly turn into actual products and features, it can be fun to take a look at some of the latest Apple Watch patents and purse out which could be applied to Apple's future lineup of software, services and hardware - and which are simply there "just in case." Looking at your wrist for a notification while you're driving is just as dangerous as looking at your phone. Apple has a patent that describes a feature which would use the Apple Watch's sensors to determine if you were driving and then limit your notifications. This is a feature already available on the iPhone, called Do Not Disturb while Driving. Purcher says that since it's already available on iPhone, it's likely to soon become reality on the Apple Watch. Apple has patents that would place photodiodes below the display of the Apple Watch. These would sense the amount of light on top of the device and would be able to decipher the light patterns and match them with gestures you could use to control your Apple Watch. Slivka says this is something Apple has been working toward on the iPhone as well. Since it's likely to come to the iPhone, it's also likely to come to the Apple Watch. However, Slivka points out that Apple would first need to miniaturize the photodiodes to fit on the smaller Apple Watch. Shades of Project Jacquard; this Apple patent would create woven fabrics that are touch sensitive, which you would then use to play music or adjust volume or other similar menu items. Purcher doesn't think this is a priority for Apple at the moment, but may invest in it to keep pace with Google and Levi's on Project Jacquard. Slivka says cost and technological hurdles may mean this one is a way's off. Face ID is the big new feature on the very expensive iPhone X, and recently a patent was published showing Apple was interested in bringing the tech to the Apple Watch as well. But how likely is it? "It's a possibility, obviously they had to miniaturize things a lot for the iPhone X so you have to go even a lot further to get it down to an Apple Watch size," Slivka says. "Then you have the tacked-on battery life, that was the concern for the iPhone X." Plus, Slivka points out that putting a camera on the front of the Apple Watch would likely just be for Face ID, as people may not take to FaceTiming and taking selfies from their wrist. Would Apple spend that much for Face ID? The squircle that is the Apple Watch isn't exactly the most beloved design of all time. It certainly works well enough if sales are your only barometer of success, but some people just want a round Apple Watch. Well, this patent certainly goes for that. Slivka doesn't see Apple going that direction, however. "That's been something that's been discussed for a while," he says. "Obviously, that's the traditional shape of a watch face but it's not always ideal for displaying information like text." Haven't you wanted an Apple Watch with longer battery life so that you can actually use it for sleep tracking? Well, this patent would create an external portable charger you could use while wearing it. The bendable, possibly graphene battery would attach to the band while the connector would attach to the bottom of the Apple Watch. Slivka says there was a company that was trying to do something similar, and that it's technically feasible. However, he also points out a better solution would be to make a smart band with a built-in battery that plugs into a diagnostic port of some kind where the band connectors are. This rumor has been bubbling around for some time now. Smart bands with built-in sensors that could allow your Apple Watch to better track your workouts. Specifically, this set of smart bands would come with advanced pressure sensors that could check how much effort you were putting forth with your hands, like if you were doing a bicep curl or something. These have made sense for Apple in a number of ways. "One is the fact that Apple has said it doesn't want the Apple Watch to have to go through the FDA approval process, but that doesn't necessarily have to be true of accessory bands. So if there are some medical sensors Apple wants to include in the Apple Watch, this could be one way to do it," Slivka says. "The other possibility is specialized sensors that not everyone might need and which might take up too much room in the watch itself. Moving them to the band perhaps gives you a new contact point on the body for measurements and can be sold separately only to those users who need that specific sensor." This is another big patent for the Apple Watch that's been floating around for a long time. It looks and sounds futuristic and sleek as hell. You've got bendable displays that wrap around your wrist and you've got a round face that flows into the display bands. You've also got something expensive to make that might not make sense to actually make and develop, according to Slivka. Purcher says this patent actually has a little more history to it than it first appears. The patent was actually acquired by Apple and is a utility patent rather than a design one. That utility is painted in a broad stroke rather than pointing to something specific for the future. However, there is hope for a wraparound Apple Watch. "So no, Apple Watch is unlikely to ever have that specific design, but they could design a future watch with a wraparound display as they've Apple hinted in a patent filing here," Purcher says. 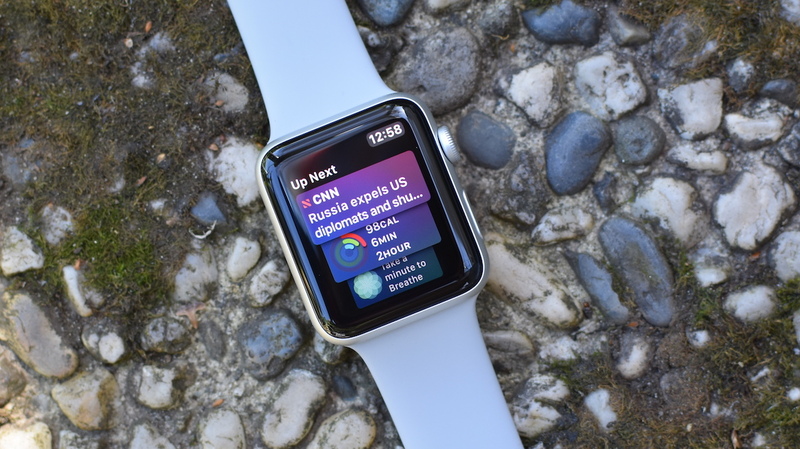 "With flexible displays advancing as quickly as they are and taking on very creative form factors, a completely different Apple Watch form factor could arise. Samsung is also working on a similar idea."